News, as the name suggests, needs to be new. Wait too long to get coverage of a story and media outlets won’t cover it because it’s no longer news. Equally, you can get a press release out as quick as possible, and the story gets stuck at any number of points between a journalist’s inbox, never to be seen again. Timing is everything. Sometimes, however, you can get coverage faster than you can say: “our local media is too trivial/has delusions of grandeur/doesn’t care about green issues” (delete as appropriate). 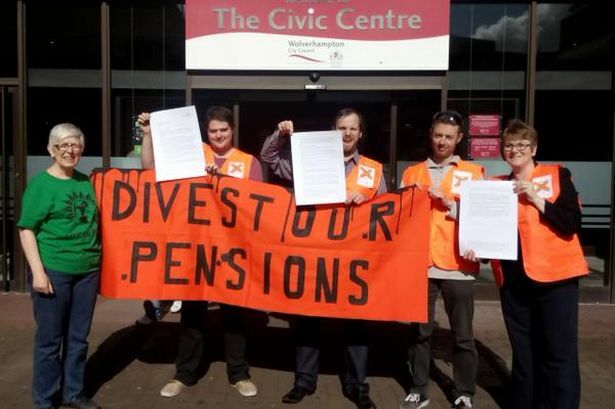 One such occasion was the launch of the Divest West Midland Pension Fund campaign. On Friday 25th September, campaigners from the different groups involved came together to hand in letters to the pension fund committee calling on them to divest from fossil fuels, as well as holding a banner and handing out leaflets outside. No sooner had I got back to the office and sent out the press release with photos, than the article appeared on the Birmingham Post website. Getting coverage within a few hours of an action in the Birmingham Post is a bit of a record breaker, considering the next day or two is the usual. Another example of relatively quick coverage was our reaction to the council’s plans to allow inedible food scraps into garden waste collection. Within 24 hours of sending the press release, I’d completed an interview on New Style Radio Community Radio Station. I talked briefly about the campaign, making the point that although it was good to see the council responding to our asks, this was not a strategic waste strategy! It wasn’t just about fast, proactive coverage. Back in September, as we went to press for the last issue, I spoke on BBC West Midlands on planning and greenbelt developments, within a couple of hours of being called. With Waste isn’t Rubbish ramping up again, hopefully we’ll have more opportunities for quick coverage. Although I, for one, won’t mind if coverage takes an hour a week.